2018 was quite the year for KAWALA. They released their compelling debut ‘D.I.L.Y.D’ EP, which featured singles ‘Small Death’, ‘Do It Like You Do’ and ‘Funky’. Amassed over 9 million streams. Played their third sold out London headline show, as well as appearances at Liverpool Sound City, Dot To Dot Festival and Neighbourhood Festival. 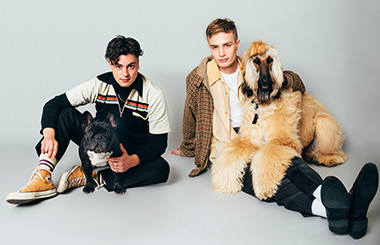 They headlined BBC Radio 1’s Jack Saunders presents Hopscotch Tour alongside Apre and Sun Silva as well as performing at The Great Escape’s First Fifty showcase in November. The KAWALA juggernaut continues apace in 2019 having been announced as support for Dodie on her UK and IRE tour in March, as well as appearances at Eurosonic, Live at Leeds, This Is Tomorrow and Neighbourhood Festival and their own headline UK and Ireland tour in May. KAWALA will stop in Dublin on Wednesday May 15th Upstairs at Whelans. Tickets on sale Friday February 1st from Ticketmaster.